Are you looking for an iPad app management tool for your Mac? 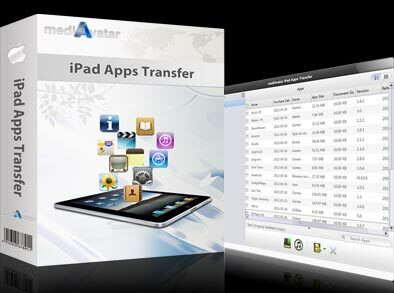 MediAvatar iPad Apps Transfer for Mac will definitely be the perfect one for you to manage your iPad apps. 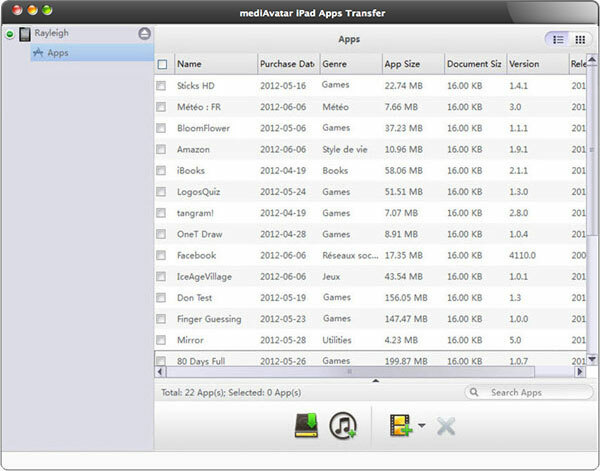 MediAvatar iPad Apps Transfer for Mac supports transferring apps between iPad and Mac. With it, you can also copy apps from iPad to iTunes, back up iPad apps to Mac, delete or move the apps back to iPad. With MediAvatar iPad Apps Transfer for Mac, it also becomes easy to add, save and delete the app documents for iPad apps. With MediAvatar iPad Apps Transfer for Mac, you can backup apps from iPad to your Mac or iTunes with ease, transfer apps back to iPad with few clicks, delete apps on your Mac directly. It’s easy to add app documents from Mac to iPad, save app documents to Mac for backup or delete app documents from iPad directly with MediAvatar iPad Apps Transfer for Mac. All apps on your iPad will be showed up automatically as long as it is connected to the Mac. It saves time greatly to transfer iPad apps in batch instead of transfer them one by one. If you choose an app, the app documents info including Name, Modified time and Size will be showed up with. If you want to search an app with MediAvatar iPad Apps Transfer for Mac, what you only need to do is to input the name of the app, and then the app you need will appear. iPad Wi-Fi, iPad Wi-Fi+3G, iPad 16GB, iPad 32GB, iPad 64GB, ipad 2, the new iPad, iPad 4, iPad mini, iPhone 5 are all supported. English, German, French, Spanish, Italian, Simplified Chinese, Traditional Chinese and Japanese are all available as interface language. Mac YouTube to iPad Converter to download and convert YouTube to iPad on Mac and enables you to watch YouTube videos via iPad offline.